The eyecups on the eyepieces of binoculars provide the correct eye relief distance so you get a full field of view. Eye relief is a simple optics term that can be checked, and possibly improved, in a few moments by checking your binocular and your spotting scope eyepieces to assess the field of view you see. Most eye relief problems are reserved for birders who wear eyeglasses when birding. But there is a simple way of getting a full look at your entire field of view through the eyepieces of binoculars and spotting scopes. Today’s optics have a most effective way of preserving a full field of view – just by adjusting the eyecups that you can easily and quickly adjust for the best possible views. Eyecups come in the form of pull-out/push-in models, or roll-back/roll-forward rubber eyecups that you simply roll down or extend – depending on whether the user is wearing glasses, or not. Simply use the eyecups in the retracted position when wearing glasses, and in the fully extended position without glasses. It’s that easy. 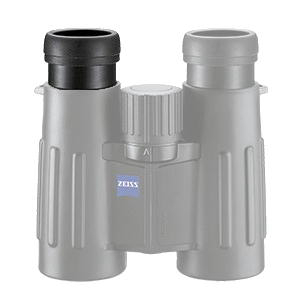 Just to appreciate the difference, look through your binocular with the eye cups in both positions, with and without your glasses on, and you will easily understand the importance of the correct use of eyecups. Then too, if you’re in the market for new optics, be sure the eyecups are to your liking, along with the field of view you see. Sometimes you will see people inexperienced with optics take off their glasses before looking through a binocular or spotting scope. That’s not necessary and they should be nicely encouraged not to remove their glasses – just adjust the eye cups for them – it’s a helpful lesson.